With a swimming pool and green surroundings, this hotel is a calm and comfortable starting point for discovering Provence; the island of Porquerolles, and the Haut Var. Well-designed rooms have been decorated with attention to detail and are comfortable and functional. Whether you need to sleep, relax or maybe even work, you will be free to make the most of the peace and quiet. All rooms are en suite and have all the modern amenities you will need. Everything is designed to give you a feeling of comfort, calm and efficiency. - Take the exit to the East, taking the A57 in the direction of Nice. - Head in the direction of Hyeres while following the A570. - Take exit 6. La Bastide Verte is on the right and the hotel is on the left 800 m further on between Volswagen and Mercedes. - On the A57 in the direction of Toulon. - Exit in the direction of Hyeresen, following the A570. - Take exit 6: La Bastide Verte/Guard/ZI. 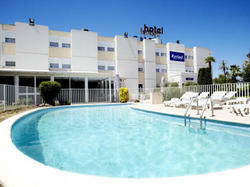 - The hotel is on the right, 800 m between Volswagen and Mercedes in the RN98 Hyeres direction. With a modern décor, this room features a TV and a private bathroom. With a modern décor, this room features a TV and a private bathroom. This room cannot accommodate any extra bed.